It’s the linchpin argument of the anti-fracking movement, and federal researchers are once again saying it’s without merit. Drilling fluids tagged with unique markers were injected more than 8,000 feet below the surface, but were not detected in a monitoring zone 3,000 feet higher. That means the potentiallydangerous substances stayed about a mile away from drinking water supplies. Eight new Marcellus Shale horizontal wells were monitored seismically and one was injected with four different man-made tracers at different stages of the fracking process, which involves setting off small explosions to break the rock apart. The scientists also monitored a separate series of older gas wells that are about 3,000 feet above the Marcellus to see if the fracking fluid reached up to them. The industry and many state and federal regulators have long contended that fracking itself won’t contaminate surface drinking water because of the extreme depth of the gas wells. 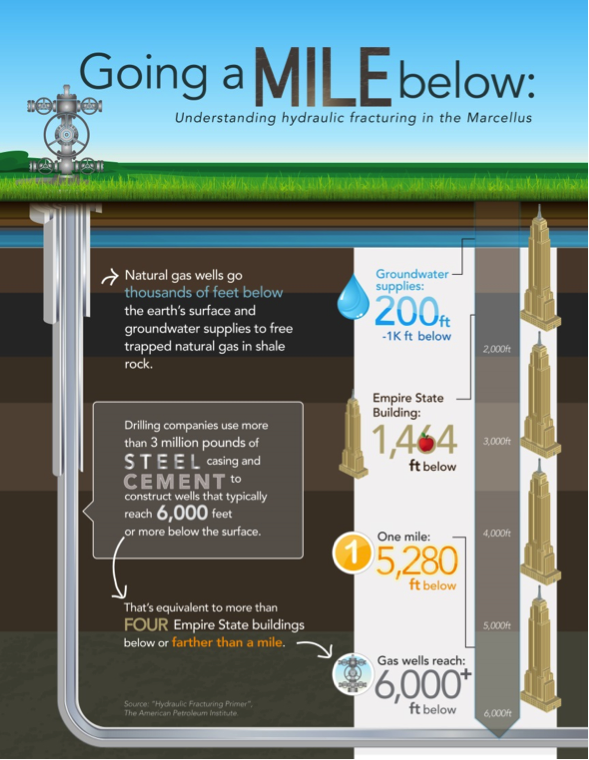 Most are more than a mile underground, while drinking water aquifers are usually within 500 to 1000 feet of the surface. On his “Frequently Asked Questions” page, Josh Fox – director of Gasland and Gasland Part II – claims the threat of water contamination from hydraulic fracturing is “very serious” and that fracking fluids “seep into the water supply.” Today’s findings – based on actual research in the field – appear to directly contradict that claim. This latest research from NETL also adds to an extensive list of expert testimony and research from federal agencies and regulators that similarly yielded no evidence of hydraulic fracturing contaminating groundwater. For example, Lisa Jackson – President Obama’s former EPA administrator – said last year that “in no case have we made a definitive determination that the [fracturing] process has caused chemicals to enter groundwater.” A year earlier, she told a congressional panel that she was “not aware of any proven case” where such an incident had occurred. Prior research from the EPA also noted there were “no confirmed cases” of hydraulic fracturing contaminating drinking water supplies. Meanwhile, state regulatory agencies across the country – who are the entities tasked with actually regulating hydraulic fracturing – have consistently affirmed that the process does not pose a credible risk to drinking water aquifers. It’s worth pointing out that NETL’s research is still ongoing, which means there will be additional findings to help inform the discussion over the safety of hydraulic fracturing, and indeed shale development as a whole. But today’s research is certainly “good news,” as Duke University’s Rob Jackson noted.